Mudgee Endurance Riders Club will dedicate its 40th anniversary ride on May 25 and 26 to its veterinarian of 36 years, the late Ray Gooley. Planning is well underway for the 40th ride which will start from the Cooyal Progress Association Hall on Wollar Road. The main event of 83 kilometres will head out at 6am on Sunday, May 26, and a 40-kilometre training ride will begin at 7am. There will also be a 20-kilometre social ride on Saturday afternoon starting at 1pm. Vetting pre-ride takes place from 11am on Saturday. Swiss Protest "Negative Evolution of the FEI discipline Endurance"
In a March 26, 2013, letter from the Swiss Federation, sent to the FEI and distributed to the National Equestrian Federations and European Equestrian Federation, the "negative evolution of the FEI discipline Endurance in the last few years" and the well being of the equestrian sport of endurance and its horses has been addressed. The letter was written "on behalf of many worried riders, trainers and officials, but also observers in the public, media and animal protection circles." The letter stated, the "actual situation of FEI Endurance is taking forms that the Swiss Equestrian Federation cannot accept any longer." The letter addresses the "multitude of witnessed and documented cruelties to horses… tremendous fracture frequencies… dangerous treatment protocols… as well as cheating actions before and during the Endurance races… in parallel with the non-taking of responsibility and function of certain officials…"
A "dramatic incidence of positive medication and doping cases" has been observed, along with inequity in competition. The Swiss have petitioned the FEI to take immediate and efficient measures against the doping of endurance horses and the documented non-equity of competition. The Swiss letter precedes letters of concern from the French Equestrian Federation, and the Belgian Equestrian Federation to the FEI in October of 2012. The Belgian letter dated October 2, 2012, addressed (google translate) "the number of dead from exhaustion or horses euthanized due to spontaneous fractures has reached unimaginable proportions…" and requests the FEI take the (google translate) "necessary measures to ensure that perpetrators are actually banned from equestrian sport and that such actions quit permanently." The French letter, dated October 12, 2012, addressed "a welfare issue concerning endurance discipline," pointing to 3 horse deaths during international endurance competition: "Concerned Horses dead after having passed vet gate inspections either during the track either after the end of the track… These cases are preoccupant for all endurance stakeholders. Here is a risk to tarnish the public perception of endurance discipline…"
No public comment so far from the FEI. Abu Dhabi: Khaled Abdullah Ahmad Al Harmoudi riding 12-year-old Ashraf Sparkling Polaris won the 120-km Al Wathba Night Ride at the Emirates International Endurance Village in Al Wathba, Abu Dhabi on Friday night. Al Harmoudi was followed home by Dana Mohammad Sharif Al Mutawa on Syferpan Cosmo with Rashed Hamoud Humaid Al Junaibi on Sarah Jones Te finishing third. The Night Ride began at 5.15 pm and winner crossed the finish line at midnight with a time of 4 hours 10 minutes and 37 seconds. A total of 166 riders took part in the 120-km event that was run in four stages of 40km, 40km, 24km and 16kms. The winner drove away a 4WD car for his effort while all those who completed the event shared a total prize fund of Dh 450,000. Sheik Mohammed, founder of the shamed Godolphin operation, has been tainted previously by three equine doping infringements involving himself, his family and his horses. Thoroughbred racing's biggest scandal continues to unfold following an eight-year ban for trainer Mahmood Al Zarooni after anabolic steroid stanozolol was found in some of Godolphin's horses. But the Sheik has been in trouble with the same substance before. Both he and his son, Hamdan, the Crown Prince of Dubai, have been banned after traces were found in the horses they were riding. And in a third case, a ban was handed out to a British rider using a horse borrowed from Sheik Mohammed that tested positive for another banned steroid. The Sheik was suspended for six months in 2009 and fined £2,500 by the International Equestrian Federation after his mount Tahhan tested positive for banned substances, including stanozolol, in two competitions. In addition, Tahhan's trainer, Abdullah bin Huzaim, was banned for 12 months. In a statement at the time, the Sheik said he had a stake in 700 endurance horses but could not be expected to be aware of each one's medication protocol. They step through the early morning drizzle with a catwalk grace. A dozen gorgeous horses in a line, worth hundreds of thousands of pounds, if not more. The traffic stops at the sight of them, because Newmarket is a racing town that respects these dawn patrols. As the thoroughbreds cross the road, their hooves clatter and their riders mutter gossip to each other in many different languages. There is a lot to talk about. Their sport is reeling this weekend from one of the greatest scandals it has ever known. The discovery of illegal performance-enhancing drugs in 11 horses at the Moulton Paddocks, which sits behind locked gates on a hill two miles out of Newmarket, was such a huge shock because of the man who owns it. Sheikh Mohammed bin Rashid Al Maktoum is one of the most influential figures in racing across the world, with a massive training operation called Godolphin that is based both in Dubai and in this Suffolk town. As Simon Crisford, Godolphin's spokesman, fielded questions about Mahmood al-Zarooni on Thursday, he found himself answering queries about another trainer banned for the use of anabolic steroids with whom Zarooni had a strong association. Before being hired as Godolphin's second trainer in Newmarket, Zarooni served as assistant in Dubai to Mubarak bin Shafya, who was banned from the separate sport of endurance racing in 2011 over the use of stanozolol, one of the steroids that Zarooni has admitted using. Crisford played down the significance of Shafya in Zarooni's racing education, saying that the latter had served 10 years under another trainer, Ali al-Raihe, compared with just one under Shafya. He pointed out that Shafya's case came after Zarooni had been hired, adding of Shafya: "He didn't get banned from thoroughbred racing. I wouldn't have been aware of that." Pressed as to whether Shafya's case raised any concerns for Godolphin over Zarooni, Crisford said: "What are you trying to imply? We didn't take it into consideration." RIDERS, horses and strapping crews will travel from across Australia and overseas to compete in the Tom Quilty Cup in Kilkivan in June - the ultimate test of endurance where participants aim to complete a 160km course within 24 hours. The first heavyweight or middleweight division competitor across the finish line wins the 2013 Tom Quilty Gold Cup award. The original perpetual cup is a permanent exhibit at the Stockman's Hall of Fame in Longreach, Queensland. For most competitors, the overall aim is to complete the five-leg course and receive an esteemed Quilty Buckle Award. In the spirit of the ride's motto - To Complete is to Win - a specially crafted belt buckle goes to every successful competitor in recognition of the high standard of horsemanship required to complete the rigorous course. This means many long hours in the saddle and the careful tending of tiring horses. At the end of the race, each mount is vetted and must be deemed in sound condition and fit to continue. DUBAI, April 24 — Dubai ruler Sheikh Mohammed Bin Rashid Al-Maktoum ordered Wednesday the closing of his Godolphin horse stables in Newamarket, England, after one of the stables trainer was charged with doping. Samples from 11 of his horses at his Moulton Paddocks stables run by trainer Mahmood Al Zarooni revealed to contain anabolic steroids, a forbidden substance that can increase a horse’s endurance. Sheikh Mohammed bin Rashid Al Maktoum, the driving force behind Godolphin Racing, served a six-month “athlete suspension” in 2009, after a horse he rode tested positive for prohibited substances in endurances races – in which a tough indigenous Arabian breed are usually preferred to the thoroughbreds used in flat racing – in Bahrain and Dubai. The discipline, which involves long-distance treks of 100 miles, is the Fédération Equestre Internationale’s fastest-growing sport. However, the increase in popularity has been accompanied by a disproportionate incidence of doping in the Middle East. Endurance has also provided embarrassment for the sheikh’s junior wife, HRH Princess Haya of Jordan. She was elected president of the FEI in 2006 on a ‘clean sport’ mandate, and hired former Metropoliran Police Commissioner Lord Stevens to beef up integrity. The FEI administers eight disciplines, including the Olympic sports of show jumping, eventing, and dressage, yet endurance accounts for eight of 11 doping cases currently under investigation, seven of which involve Arabic riders, three from the United Arab Emirates. Further, seven UAE riders were disciplined in medication control cases in 2012, six in 2011. One repeat offender was Mubarak Khalifa Al Shafya, stripped of his FEI Open endurance title in 2008 while manager and trainer at Sheikh Mohammed’s Al Asaafa stable. Mubarak then trained thoroughbred racehorses for the sheikh in Newmarket and Dubai. In 2011, the FEI were concerned that five endurance horses managed by Mubarak had tested positive in the previous two years. Abu Dhabi: The Emirates International Endurance Village in Al Wathba will sign off its 2012-13 endurance season with a 120km Al Wathba Night Ride on Friday, with a car and Dh450,000 on offer as prizes. Entrants will get off to a mass start at 5.15pm and the ride will involve four stages of 40km, 40km, 24km and 16km. “This is the last ride of the 2012-13 season here at Al Wathba and is being held under the instruction and directives of Shaikh Mansour Bin Zayed Al Nahyan, Deputy Prime Minister and Minister of Presidential Affairs, and Shaikh Tahnoun Bin Zayed Al Nahyan,” said Adnan Sultan Al Nuaimi, Director General of Abu Dhabi Equestrian Club. Manama, April 22 (BNA)--The Media Office and Information Centre of Shaikh Nasser bin Hamad Al Khalifa will issue a book on the history of equestrian sports in the Kingdom of Bahrain, starting from horse racing to showjumping and endurance races. The decision was in compliance to the directives of Shaikh Nasser bin Hamad Al Khalifa, the Supreme Council for Youth and Sports Chairman, Bahrain Olympic Committee President and Honorary President of the Bahrain Royal Equestrian and Endurance Federation. The book will include the support and backing of Bahrain’s leadership to equestrian sports since its birth, down to the prosperous era of His Majesty King Hamad bin Isa Al Khalifa. It also highlights the history of horses in the Kingdom, its most prominent strains and competitions that were held during horse racing, showjumping and endurance events, in addition to the most important figures that supported these races as well as horses owners, who had the finest horses, besides leading Arabian breeds in Bahrain. The Media Office and Information Centre, headed by Director Tawfiq Al Salhi, will work on putting all Shaikh Nasser’s directives into writings and document it in this first-of-its-kind release. Shaikh Nasser said that issuing this book comes under the guidance of His Majesty King Hamad bin Isa Al Khalifa, the first supporter to horses in Bahrain, and aims to document the equestrian sport in the Kingdom, which has a long honorable history thanks to the continued backing of the nation’s leadership. For many in “the west”, the very mention of Iraq can conjure up mostly negative connotations of war and strife. But for horse lovers – arabian horse lovers, particularly – the country and the immediate region should be celebrated and appreciated far more that it currently is as the origin of the world’s oldest and most influential breed. This new book by Iraqi arabian breeder and racing enthusiast Dr Mohammad Bin Abdulaziz Al-Nujaifi sheds much light on Iraq and its neighbors and their horse-loving traditions. The author needs no introduction in arabian racing circles in Iraq and in Europe, being the top owner for all races in all countries in 2012 according to the statistics of the International Federation of Arabian Horse Racing Authorities (IFAHR) – the third consecutive season he has held the title. Despite having just returned from her most recent competition, the 2013 Endurance Horse Ride in Fontainebleau, France, neither jetlag nor a pre-Songkran workload could fizzle Wipawan Pawitayalarp's exuberant enthusiasm in relaying her experience. What she thought would be just a warm-up for her horse, Mulawa Angelus, turned into a victory of a kind. "I had not hoped to win at all because it was such a large-scale competition, with professional riders from all over the world competing. It was also cold, and my horse was not used to that kind of weather," said Wipawan, an award-winning Thai endurance rider. In the first phase of the ride, she and her horse were off to a good start, being in the top five. They continued to speed through the snowy course at such a rate that she could hear the air whizzing past. On the last 3km of the track, holding third place, another horse overtook them, bumping them down to fourth. "At the time, I wasn't completely deflated or disappointed, because my intention in this competition was really to just test the water and gain experience. For me, to complete [the race] is to win," she explained. However, at the last corner, things took a turn when the rider who had passed her took a fall. The Golden Horseshoe ride on Exmoor is to become a 'festival of endurance' this year (May 12-14) as organisers add three new tests and an invitation-only para class, with a number of high-profile para riders set to take part. New competitive classes for 2013 include the Exmoor Extra (120km split into three rides of 40km each day for advanced combinations), the Exmoor 40 (a 40km ride for those competing at Open level or above) and the Exmoor Novice (a 40km ride for novices, with slower completion speeds). The programme, which includes the 48th running of the famous Golden Horseshoe – in its early days 75 miles and now a daunting 100 miles – is completed by the two-day Exmoor Stag class over 80km and 40km routes, the 80km one-day Exmoor 80 and the popular Exmoor Experience class, where the two 40km-a-day rides are designed to give riders and horses a taste of competition over the very testing Exmoor terrain. The 120km route of the inaugural Royal Windsor Endurance CEI 2* ride being held in association with and presented by Royal Windsor Horse Show (8 – 12 May 2013) is set to take in a circuit of Ascot Racecourse, it has been announced. Not only will the 60 riders participating in the newly introduced event on Friday 10th May get the opportunity to tackle a route around Windsor Great Park, they will have the thrill of completing a single circuit around the National Hunt section of the racecourse. The Ascot stage of the event will take place early in the race as later in the day it will be business as usual at the racecourse which hosts its meeting of the Flat season that evening. Achieving speeds of between14-22km per hour, the endurance riders will complete the 120km route in four separate sections with riders returning to a single vetgate on the Review Ground for inspection by the team of international vets and judges. More than 90% of the course will be off-road. Several historic rides in the Great Park have been opened for the event including the Long Walk which it will cross. Endurance competitors will also be given the unique opportunity to ride up to and circuit the equestrian statue of HM Queen Elizabeth II, situated on the highest point of Queen Anne's Ride. The sculpture, a Golden Jubilee gift from the Crown Estate, stands 12ft 6in tall on a 10 foot plinth and will be one of the focal points on the final loop of the event. Continuing a tradition of association with international endurance competition, this event is generously supported by The Kingdom of Bahrain, who recently sponsored the FEI 2011 European Open Endurance Championship in Florac, France. Visitors may watch the endurance event free of charge, access to the event is available in the ‘Review Ground’ which is where the vetgate and start finish is located. The Review Ground and public parking is off the permanent car park on the South side of the A332. Signs will indicate the way. Royal Windsor Horse Show box office is now open and tickets can be purchased online at www.rwhs.co.uk or by telephone from 0844 581 4960. Record entries have been received by Royal Windsor Horse Show organisers for this year’s 70th anniversary show early next month. Some 4095 entries have been made for the 174 classes for the show, from May 8 to 12. Over three years, entries have increased by 40%. Rui Lanternas and Safira de Ala won the Portugal National Endurance Championships at Fronteira, Portugal on April 12-14 in a close race over Margarida Oliveira Soares and Xelio. Filipe Fialho and Aziza were third. Average speed for the winner was 16.193 km/h. Lexington, KY- United States Equestrian Federation (USEF) will host an Outing for the 2013 FEI World Endurance Championship for Juniors and Young Rider Team April 18-20, 2013 at McCulley Farm near Jasper, Florida. Pending approval from the USEF High Performance Working Group and USEF Executive Committee, this Outing will serve as a Selection Trial for candidates interested in applying for the U.S. Team. 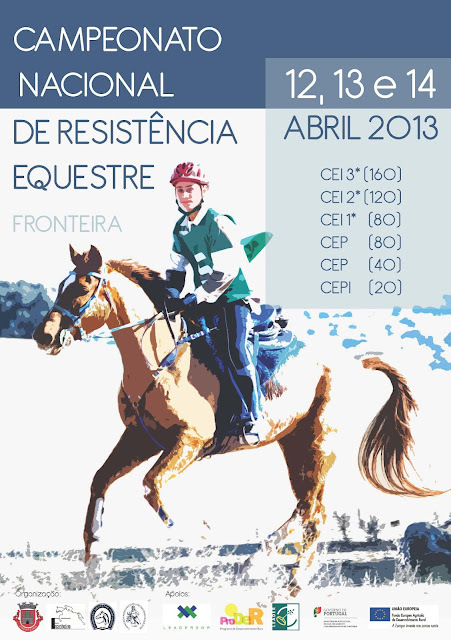 The Outing will consist of a preliminary examination of horses by at least 2 members of the Veterinary Panel on Thursday, April 18, followed by an 80 Kilometer competition on Friday, April 19. There will be an examination of horses at designated stages throughout the competition and a post -competition evaluation of all horses on Saturday, April 20. Further details regarding the Outing and Selection Procedures will be published shortly here. The 2013 FEI World Endurance Championship for Juniors and Young Riders will take place July 27, 2013 in Tarbes, France. More information about the Championships can be found here. Follow the 2013 U.S. Endurance Team here. From the Catalan Federation of Equestrian and on their official website, give us news about the work of the organizing committee said new championships in Spain, as well as the speed with which they take their actions. The decision last week by the FEI, with the support of the FCH, to grant the organization Sant Feliu Sasserra Championship of Spain, is forcing drivers to work around the clock to carry out this competition. Anna Yebra, head of the organizing committee is aware of the difficulty of organizing a tournament of this magnitude in just seventeen days before the start of the test but as she explains, "this situation is a challenge for all of us but we are convinced that everything will be fine. " On the tour they intend to present the riders involved, Yebra Anna believes that will be a very technical course and where you can find some steps that are part of the official tour of Sant Feliu Raid that takes place this coming weekend and is sure to be a test of contact for many pairs. On participation, organizers hope to have the presence of between 40 and 60 pairs for each category (Absolute and Young Riders). Regarding the choice of Sant Feliu Sasserra to host the Championship of Spain, Anna Yebra greatly appreciates this fact since "will be positive for everyone, especially for all the riders participating Catalans, and to remember that almost 70% of the inscriptions of this championship are Catalans and the fact it at home will not only competitors, but also be positive also for the Catalan Federation ". Finally, we must remember that both the President of the FEI, Javier Revuelta, as the President of the Catalan Federation of Equestrian, Emili Zegrí, have been appointed members of the Honorary Committee of the Championship of Spain of RAID. " JAFFER Mirza of Victory Stable won the 120km Crown Prince Cup Endurance Horse Ride Championship early yesterday morning. More than 100 riders from all over Bahrain, in addition to entries from Saudi Arabia and Qatar, fought it out for cup glory in this challenging night ride, which marked the culmination of the 2012/13 endurance season in Bahrain. Held at the Bahrain International Endurance Village in Sakhir, the race lived up to expectations with participants showing high level of competitiveness and riding skills, as the championship was decided in the very last metres. Riding Perspolia, Mirza completed the event with a total ride time of four hours, 51 minutes and 36 seconds with an average speed of 24-km per hour. He was followed by Al Asayel Stable's Ahmed Hazeem (5:25:25), who came second, while Shaikh Mohammerd bin Mubarak Al Khalifa (2:26:38) of Al Zaeem Stable rounded off the podium on Adios. Famous in the equestrian world as the toughest and oldest Endurance event in the UK's competitive long-distance riding calendar, Exmoor's Golden Horseshoe Ride has raised eyebrows by introducing a new Para Invitation class this year. Inspired by the London 2012 Paralympics, Endurance GB, the governing body for the sport of Endurance Riding in Great Britain, launched Para Endurance last year with a class open to riders who were already endurance members. The Golden Horseshoe has gone one step further by inviting Para-riders with no experience of Endurance to compete in the new 15 mile class. Chairman of the Organising Committee Barbara Wigley admits some were surprised by this inclusion "The Golden Horseshoe is well-known as one of the toughest endurance events, so to introduce a novice Para-invitation class to this particular event is a challenge, but we are determined to cater to all abilities. We really want to encourage people who may not otherwise think that they could compete in this discipline..."
One more title for Mary, our great bichampion World and Europe. From Equestrian Online, news of the award reflected our great rider. Maria Alvarez, twice champion of the World and European Raid, is today one of eight ambassadors FEI Solidarity, the development program of the International Equestrian Federation. Inspired by the Olympic Solidarity model and founded in 2011, FEI Solidarity focuses on providing opportunities for future generations of athletes, as well as those working in equestrian communities, so they can establish their own national structures to help them develop their sports. The aim is to encourage and develop the equestrian disciplines recognized by the FEI. Ambassadors help raise awareness of this work in response to the media and visiting equestrian development initiatives around the world. So far, the program has supported eighteen projects, both funded and with technical and consulting services. These projects include horse assisted therapy for disabled children in South Africa or sports class for people with MS in Sardinia. Fifteen other initiatives will be supported by FEI Solidarity in 2013. "FEI Solidarity is an exciting initiative to create a more egalitarian equestrian community and pushes us to jointly develop new and exciting projects that will evolve the sport we love to be truly universal," said the president of the FEI, HRH Princess Haya . "FEI Solidarity is changing lives," he added. Charlotte Dujardin, double Olympic gold medalist dressage. Britain. Laurentia Tan, Paralympic medalist. Singapore. Ingrid Klimke, Olympic gold medalist CCE. Germany. Jessica Springsteen, Jumping rider 22 years. USA. Maria Alvarez Ponton, first rider capable of combining the titles of the World Championships and European Raid (2010). Spain. Tomas Eriksson, triple winner of the FEI Top Driver (Hooks). Sweden. Lior Raz, rider competing at age 14 in Reining. Israel. Bongani Mvumvu, turner and winner of the World Dressage Challenge Final for riders under (2003). Germany. The ponies that carried Genghis Khan’s warriors are small, tough, and skittish as hell, making the prospect of riding them for 1,000 kilometers seem downright insane. American cowboy Will Grant couldn’t resist, so he entered the Mongol Derby—the longest, hardest horse race in the world—determined not just to finish but to win. THE TOILET PAPER startled the horse. I was relieving myself, and a gust of wind had unfurled the tissue in my left hand. The red and white spotted pony lifted his head when he saw the flutter, and the rope to his bridle slipped through my fingers. He looked at me with eyes full of white and his front feet spread wide, ready to bolt. We both froze. He knew he was loose. I lunged forward in a full Pete Rose slide, bloodying both my knees and scraping my exposed parts on the rocks and the short prickly grass. Just as I grabbed the rope, he jerked it out of my hand and wheeled away, kicking a hind leg at me as he sprang off. I collected myself and concluded my business while he quietly grazed about 20 yards from me. I spent the next half-hour trying to walk him down, cursing his name, or rather, because he didn’t have a name, his number, which was painted on his shoulder. Finally, he quit me and, with almost all my gear aboard, trotted off over the pale green horizon. It was 6:30 p.m., and I was now on foot on the broad and treeless steppe of Outer Mongolia’s Tamir River Valley. Below me, about a mile away, I could see the white yurts of a herder camp. Within a quarter-mile of that, I could see a man watching me. Guard dogs milled around the camp, a stark reminder that, in spite of my meticulous preparation, I had failed to renew my rabies vaccination. I decided to stop and wave. It was easy to see that I was a horseman without a horse, and the man watching me hopped on his and galloped off in the direction mine had gone. Twenty minutes later, he rode up with my pony beside him. I thanked him as best I could, with smiles and hand gestures, and he in turn made it clear that I now owed him something. I offered him my hat—a baseball cap from my hometown of Alma, Colorado—and cash, some Mongolian tugriks worth about $20. He shook his head no and pointed at my wrist. Manama, April 11 (BNA) -- Al Khalidya Stable captain Shaikh Khalid bin Hamad Al Khalifa affirmed that the Crown Prince Cup Endurance Horse Ride Championship, the concluding race of the 2012/13 scheduled to take place tomorrow, will be a great success either in terms of competiveness and organization. The prestigious event, set to tip off at 5pm at the Bahrain International Circuit in Sakhir, is under the patronage of His Royal Highness Prince Salman bin Hamad Al Khalifa, the Crown Prince, Deputy Supreme Commander and First Deputy Prime Minister.It features two races, with the main event to be over 120km, in addition to an 80km qualifying ride that is aimed to help riders qualify for major international endurance championships. And Shaikh Khalid is confident that tomorrow's action will be a well-contested battle between various stables from Bahrain that are keen to impose their authority while seeking the prestigious trophy. Shaikh Khalid believes that the main race of the day will be different from the previous years as it will be held in the evening for the first time. He noted the developed level of the Bahrain riders in recent years, which came as a result of their extensive participations in regional and international endurance competitions, and for the continued support and directives of His Majesty King Hamad to all riders and stables officials. The Al Khalidiya Stable leader also expressed gratitude and appreciation to Prince Salman to this race, which is one of the most awaiting endurance championships in Bahrain. As for his team preparations, Shaikh Khalid showed confidence in the abilities of Al Khalidiya Stable representatives to achieve remarkable results tomorrow, emphasizing the noticeable development of this sporting discipline in Bahrain in general. Meanwhile, the organisers announced five stages for the 120km, with the first and second stages to be over 30 kms each. The third will be over 25km, followed by 20km for the fourth, while the fifth is over 15km. The veterinary inspection will be taking place tomorrow between 3pm and 4.30pm, just before the start of the ride. After the race, the top three riders will be honoured at the prize-distribution ceremony, set to take place at the village. Tomorrow's ride will be telecasted live on Bahrain TV Sports Channel. This was announced after the coordinating meting between Breef Media Committee chairman Tawfeeq Al Salehi and representatives of the channel. Al Salehi said that race update will also be available on the federation website www.endurancebh.com. The website is being run by Hassan Al Doy and Mohammed Jassim Sharida. France: The Organising Committee seeks to recruit 3000 volunteers for the Games! The Normandie 2014 Organising Committee’s recruitment portal will be going live as of today (April 10th 2013) to mobilise 3,000 volunteers from all walks of life ! These volunteers will be on hand as the 1,000 competitors and horses wow the expected 500,000 visitors during the 15 days of competition from 23 August to 7 September 2014. Whether they’re from down the road or from the other side of the world, together with the region of Normandy, they will bring the biggest equestrian event there is to life ! Hospitality, communication, transport, technology, health & safety, all different types of ancillary services… Our volunteers will have lots to do and each and every one of them will be pivotal in making the event a real success. This volunteer campaign is one big group project with a place for everyone, and what’s more, it will be a shining example of human endeavour ! Our future volunteers symbolise the very essence of the Games, and they will be crucial to the success of the event. They will, after all, be the first in direct contact with the public and will welcome everyone to the Games and Normandy with their distinctive welcoming faces. The Organising Committee will need the help of 3,000 volunteers: 500 volunteers during the test events in August 2013 and a further 2,500 during the Games in 2014. These volunteers should be available during the two-week long competition from 23 August to 7 September and be able to follow the pre-event training comprised of a one-day induction course and two further days of training. The event’s recruitment portal goes live from Wednesday, 10 April 2013 (in French only) and will remain active so that volunteers can get updates throughout the recruitment process. Only the first 5 000 applicants will get a chance to be be recruited so do not wait and join now ! On Monday 8 April, the Normandy 2014 Organising Committee invited journalists and the event’s partners to a landmark press conference to celebrate the symbolic 500-day countdown to the start of the Alltech FEI World Equestrian Games™ 2014 in Normandy. This countdown was the occasion to launch the volunteer programme and the business club, to inaugurate Alltech’s new offices in Caen, and to reveal Norman - the Games’ official mascot ! The March/April of the Arabian Horse Int'l is out. It features the 22nd Edition of Qatar International Equestrian Festival, the HH Shaikh Mansoor Bin Zayed Al Nahyan Global Arabian Flat Racing Festival, Colic Researhes: Tight Junctions Crucial in Gut Function, Determination of the anaerobic threshold and maximal lactate steady state, and speed in equines using the lactate minimum speed protocol. More from East Devon Endurance rider Dace Sainsbury. Upon arrival back in the UK after our fantastic trip to Abu Dhabi with Ballota I had to take a moment to breathe, get back to reality and plan the year ahead for the other horses I am fortunate to ride in Endurance. Alongside my youngster who this year I am qualifying (hopefully) to an international level, I also have the fantastic opportunity to take the ride of French Lieutenant, a truly out standing Arabian gelding owned by Carol Legg of Hillside Arabians. French Lieutenant is a seasoned horse who came out of a successful career flat racing to excel in Endurance. In his years competing in endurance he has won 120km FEI 2*, 80km FEI 1* and national rides and last year, achieved the ultimate, at a very respectful speed completed a 160km FEI*** at Euston Park with senior rider Lorna Kidson. OFFICIALS from Bahrain visited London where they followed up the preparations to host the 2013 Royal Windsor Horse Show, to be held in the UK from May 8 to 12. The Kingdom of Bahrain is organising an international endurance horse ride on May 12 in the UK on the sidelines of the five-day show. Bahrain's delegation includes Royal Endurance Team manager Dr Khalid Ahmed Hassan, Shaikh Nasser Media Office and Information Centre director Tawfeeq Al Salehi, Ceremonies head Mohammed Naji, Royal Endurance Team administrator Tareq Al Amin and equipment official. It was yet another grey and very cold day for the Wadebridge Endurance Ride. Despite this there were cheerful faces from both competitors and helpers for this, the first Competitive Ride in the South West this season. This year, ride organiser Jo Chisholm, was planning to reduce the amount of roadwork by taking the riders along the river between Hay and Trevorder Farms for the first time. Unfortunately, the wet weather put paid to that idea but permission is there for another year, when conditions are better. For everyone competing, from those riding in the 64km class to the pleasure riders doing the 18km route, the Wadebridge Ride provides a chance to assess horse and rider fitness and to introduce novice horses to endurance. Since the route is mainly along lanes and forestry tracks, for those just starting endurance it is less daunting than some of the moorland rides. Among the 70 horses and riders competing was a large team from the Newquay Riding Club. They are aiming to qualify for the Kibis Riding Club Endurance Championship, which takes place at the Red Dragon Festival of Endurance in October, and this was their very first endurance ride. IT may seem that endurance riding is a crazy group of riders who spend all day out in the bush on their horse's back but in fact this is not the case at all. We are a family friendly group of riders who like to camp, ride and use the opportunities provided to ride some of the best countryside WA has to offer. We can even share the camp with our other four-footed friends as in most cases dogs are welcome at rides so long as they are on leads. Believe it or not you don't need to have a lot of experience in the sport, or a certain type of horse to enter into a ride. In fact, endurance is a sport that encourages people of any age and horses of any type to join - we have even had a mule. The only pre-requisite is that you and your horse are fit enough to pass the vet check before you commence. Dace Sainsbury who hails from Lyme Regis travelled recently to the Middle East with her horse Lottie for the United Arab Emirates Cup – this is her story. In November 2012 myself and my horse Ballota were invited to ride in the most prestigious endurance ride in the world, HH The President of the United Arab Emirates Cup that was held in Abu Dhabi. This invite included all costs to and from Abu Dhabi and all accommodation for both horse rider and crew. The invite came off the back of doing so well in Belgium in the European Championships. It was a moment to remember opening the letter with the invite! My beautiful little mare is always surprising me with what her and I could do and now we were going to both go on an aeroplane and fly to the desert! The travelling to Abu Dhabi went very smoothly, an unexpected surprise I must say. We were taken to a handsome hotel near Maastricht where we stayed for one night before travelling to Dusseldorf for our own flight. The transport stables were okay, could have done with bigger boxes but the grooms and the transporters were very friendly and were very obliging when I repeated instructions for the care of Lottie both before the flight and in travel. I think by the end of my lecture on ‘How and when to feed a horse a carrot’ they referred to me in Dutch as the crazy English girl. Nevertheless they must have done a good job as Lottie arrived in Abu Dhabi very settled, stabled next to a Swedish horse. So, we arrived at 6.30am on the morning of the 12th and were picked up and taken to the Eastern Mangroves hotel. First word that springs to mind. Wow! The hotel looked like an Arabic postcard, not only was it huge but it had a real traditional Arabic feel, Frankincense burning, Arabic coffee freely available and the most enormous dish of dates piled so precariously that I was pretty dubious about taking one at risk of sending the whole lot flying. That was just the lobby. The hotel rooms were absolutely gargantuan, with beds that could fit about ten of James in! SEVENTY-four horses entered the Wilga endurance ride at the weekend. With grey skies and cool wind, it was perfect weather for the first ride of the season. Entrants came from GinGin, Albany, Denmark, Margaret River and everywhere in between. The friendly, laid-back atmosphere at Wilga is always enjoyable and the beautiful wooden trophies created by Collie wood turners were well received by the riders. One man, two horses, 3,000 km. On November 1, 2012 Pete Langford embarked on a 3,000 km (1,800 mile) trek across the length of New Zealand. What inspired Pete to undertake such a challenging journey? His love of horses and nature were the main catalysts, along with a desire to raise money for Air Rescue Services in New Zealand. EasyCare and our New Zealand distributor, the Institute for Barefoot Equine Management (IBEM), are proud to sponsor Pete on this journey. Pete's horses, Two-Shoes and Cloud, are barefoot off the track standardbreds and they are traveling over the varied New Zealand terrain wearing Easyboot Gloves. The trip started at the bottom of the South Island in Bluff and will end at Cape Reinga on the North Island (you can follow their progress on this SPOT Adventure page). Pete and his horses are just finishing their route on the South Island and are currently near Picton. How are the Easyboot Gloves holding up to such a demanding journey? Brechin author John Tytler Thomson took to the limelight on Saturday when he gave a presentation to around 40 people who attended an event, hosted by the Edzell Library Action Group (ELAG), at Inglis Memorial Hall. The presentation focused on his book “Drinking the Wind - At The Limits of Endurance” with audience members coming from Edzell, Brechin, Fettercairn and Menmuir. Following his illustrated talk Mr Thomson signed copies of his book. Drinking the Wind- At the Limits of Endurance is an inspirational true story of John’s miraculous journey from paralysis to recovery thanks to the powerful spiritual bond between man and horse.